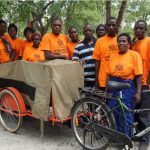 As part of our ongoing support to Transaid, Maxims have recently helped to fund the provision of bicycle ambulances in various parts of Africa. Transaid are a charity based in in the UK that works with the Logistics Industry providing support leading to sustainable projects in Africa. Details of their activities can be seen on their web site www.transaid.org .